OXFORD, Miss. – The University of Mississippi School of Pharmacy Research Clinic is looking for students and residents in the Oxford and Lafayette County area to participate in a clinical study for the antimalarial drug primaquine. The World Health Organization lists primaquine as one of the safest and most essential medications in the world. The study begins later this month and will coincide with WHO’s World Malaria Day observance April 25, which highlights the need for continued commitment to malaria control and prevention worldwide. “We are eager to begin this research in hopes of getting closer to the very real possibility of one day eradicating malaria worldwide,” said David D. Allen, dean of the School of Pharmacy. Researchers in the school are continuing research on primaquine that has been ongoing there for 25 years in hopes of improving the drug and broadening its use. 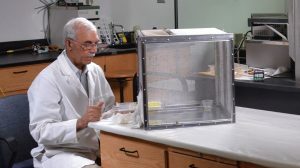 Preventative research such as this is crucial in making further advancements toward a final cure for malaria, said Larry Walker, director emeritus of the university’s National Center for Natural Products Research. Malaria kills more than 1 million people per year and affects anywhere from 300 million to 600 million people annually, according to data compiled by UNICEF. Children under 5 are most susceptible to dying from malaria, and more than 40 percent of the world’s population lives in malaria-prone regions. Primaquine is an inexpensive drug that is very effective against the liver stages of malaria parasites, Walker said. However, its use is limited because people with a genetic deficiency in a specific enzyme (glucose-6-phosphate dehydrogenase, or G6PD) have negative reactions to the drug that can cause severe damage to their red blood cells. 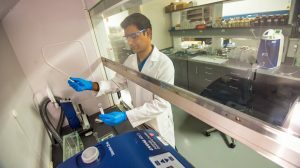 Primaquine is composed of two chemicals, or forms, that are difficult to separate, yet separating them is what Ole Miss researchers hope will help them discover how to make primaquine safer. “Researchers have studied primaquine-type drugs for many years and developed methods for the separation and preparation of the two forms,” Walker said. “We’ve shown that both forms work in animal studies, but they are metabolized differently, and one has fewer side effects than the other. The clinical trials will begin by studying the metabolism of the two forms of primaquine in normal human volunteers without the G6PD enzyme deficiency. The drugs are being prepared by an Oxford company, ElSohly Laboratories Inc. The pharmacy school is collaborating with the UM Medical Center on the project. Ole Miss students in the pharmacy program are very interested to see what new advancements come out of this trial, said Alix Cawthon, a second-year pharmacy student from Abita Springs, Louisiana. “Everyone is very excited to see the school participate in a human study,” Cawthon said. Participants in the study must be healthy adults between 18 and 60 years old. The study requires participants to visit the research clinic several times over a four-week period. Monetary compensation is also available for those who participate. This research is supported by the Defense Health Program under Award No. W81XWH-15-1-0704. For more information or to volunteer for the study, contact Kerri Harrison at 662-915-2103.